her huge range of threads, fibres, laces etc. 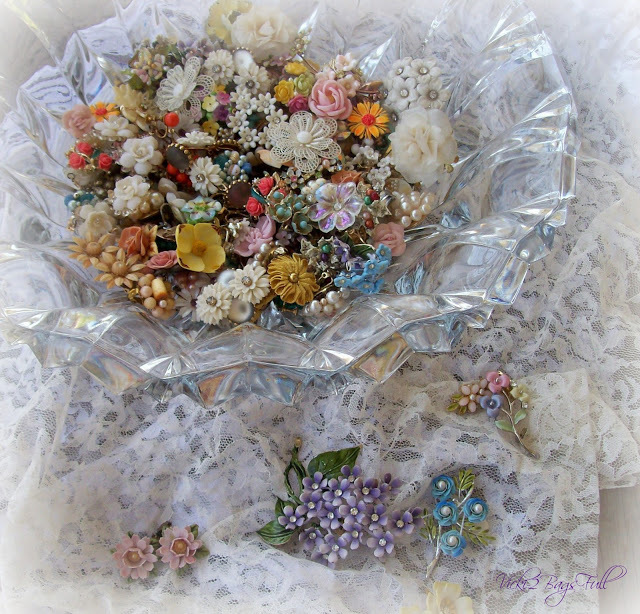 of her "Vintage Spring Nest"
for Vicki as she creates each one individually. so that gives you an idea of the actual size. Lily's Place will be the new home of a regional and national leader in the care of babies suffering from Neonatal Abstinence Syndrome, or drug addiction." (maybe even in the world???!!!). (Some of the beautiful millinery flowers Vicki will use). that babies will be treated for addictions. (Some vintage Jewellery Vicki has chosen for the nests). you will be able to view their contributions also. created in your heart and mind! and so here is a sneak peek until I reach the end! wonderful words left over my "Birds Inspire"
"Sincere thanks from my heart to yours"
Your tiny bunting is magical and is the perfect embellishment for Vicki's precious nests. Our dear Vicki is such a special person who never stops giving of her time for worthy causes such as this one. By drawing on the talents of three especially creative blog friends, these very special nests will be even more sought after - Vicki is a visionary of our times! So very kind of you Suzy to give of your time for this rewarding project - congratulations! Suzy, your buntings are PERFECT for Vicki's nests. Isn't it wonderful that she has invited us to come along to fulfill her dream? I know I feel honored! Your work is wonderful and I'm glad she has invited you, too. What charming little elements. I never heard of calling them buntings. What a really worthy and touching cause. Oh this is a wonderful project! I have seen Vicki's amazing nests. And all the ingredients you share here are foretelling the most amazing nest! Your buntings are very sweet! 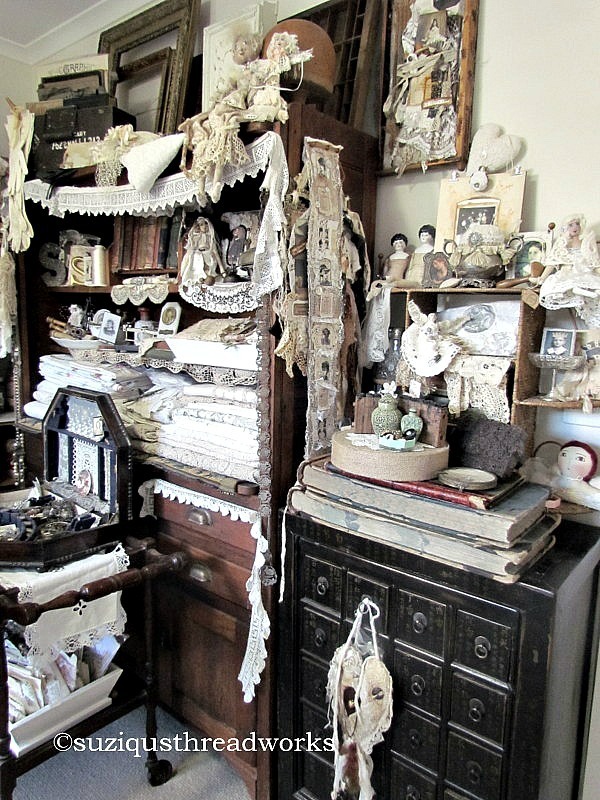 All those lovely fabrics and buttons, and lace! I am curious to see this nest comes into form. 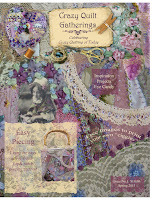 Your new fabric book looks stunning! You are not "addicted" just gifted! 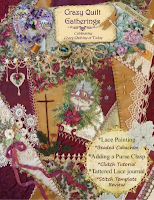 You make the most gorgeous lace books! Thank you for sharing the insightful words of Kahlil Gibran! How adorable they are my dearest Suzy... so tiny and perfect...a wonderful work, and so special, as they goes to the dear Vicki`s amazing spring nests ,and via them to help those tiny babies ,born too early !! A beautiful project made of all of you contributers,too! 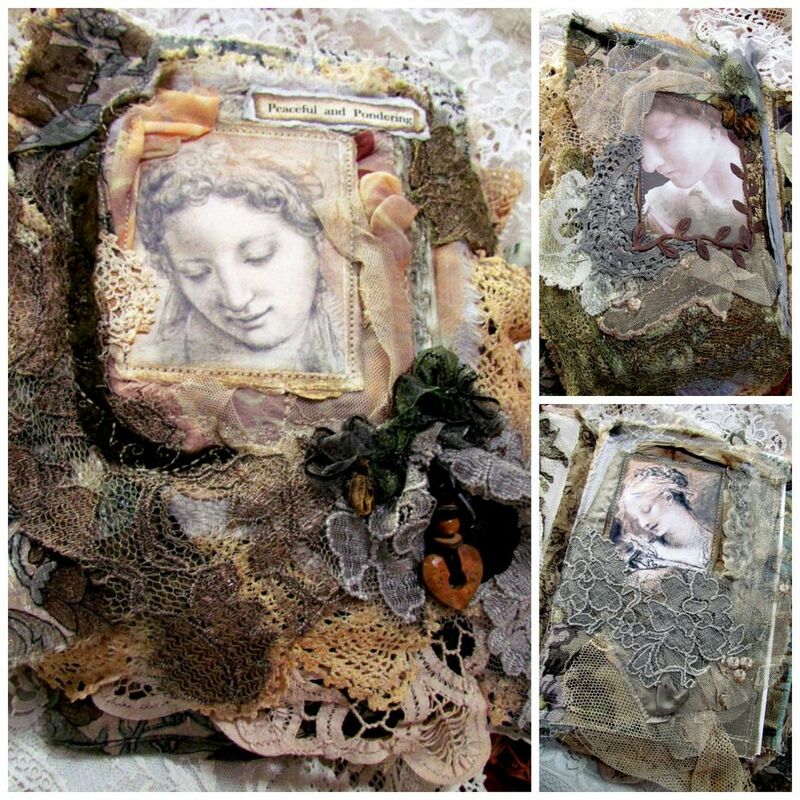 And then the little most fabolous lace book- so stunning photoes, sweet friend- I love you used the knitting, too! Amazing layers and pieces added! Dear heart friend, I hope you are feeling good, and that all is well after the weekend!! Your buntings are just the sweetest contribution to add to those gorgeous nests Suzy. What a really loving thing to collaborate on and for such a worthy cause. You both make the most stunning creations with fabric and fiber! 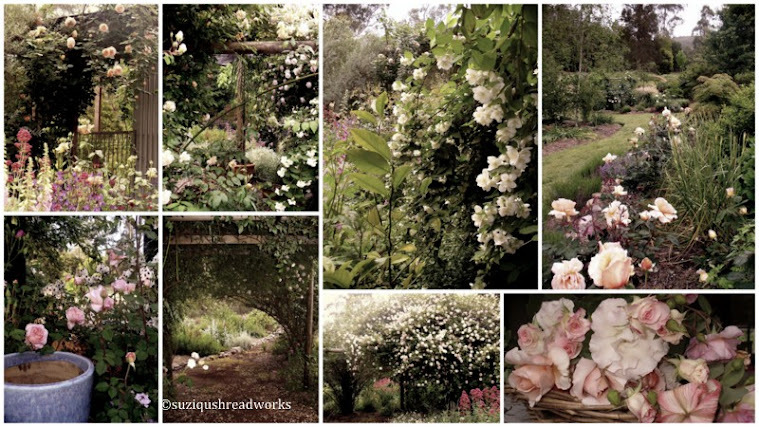 Suzy- just seeing them here again on your blog makes my heart sing! 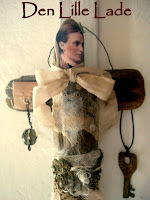 They are adorable-- your use of tiny little vintage treasures was sheer genius. They are perfect for this newest nest design and I can't wait for you to see them in their proper (and beautiful!) place on the nests. What a lovely collaboration! Your tiny buntings are sweet! What a wonderful contribution to the Spring nest . I'm so lucky and honored to be one of those who is able to get one. Thank you again for stopping by my blog and being able to reconnect again. You have Google friends connect but not that Google + thing so you are good, many are getting it and they will find it a big hassle, more gals at this point aren't though. your little buntings are so sweet and what a lovely post. Dear Suzy, what an amazing and inspiring project of your friend. She's just so generous. Love the buntings that you created for her nest. They're gorgeous and so colourful. And love the sneak peeks of your book, can't wait to see it all! Take care sweetie, big hugs from the other side of the world. You have created such beautiful buntings to adorn Vicki's nests! 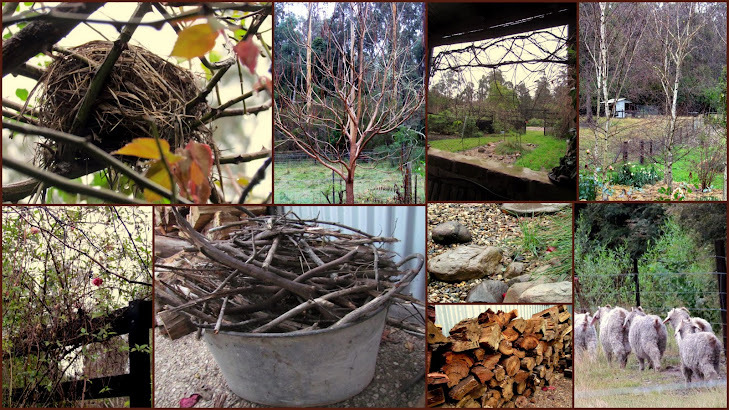 I love my autumn nest and I can see just how much love goes into creating them. Exquisite little buntings for exquisite little nests. What a joy to be involved in such a wonderful project as this. Your book looks so beautiful and invites us to want to see more, Gorgeous!! Your buntings are pure magic, incredible and gorgeous, and will allow beautiful new soul's to awaken! 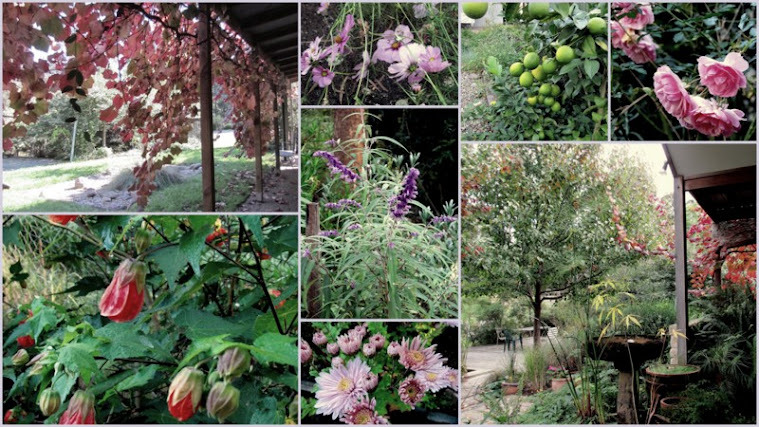 What a gloroius project Vicki has going on and you are contributing to, so wonderful of all of you! You are amaizng, and your new book is enticing as well! How wonderful that your beautiful buntings are going to be added to Vicki's gorgeous nests, and all going toward such a lovely cause! Visiting your blog and looking at all the wonderful art that you create is indeed a feast for the eyes and soul! 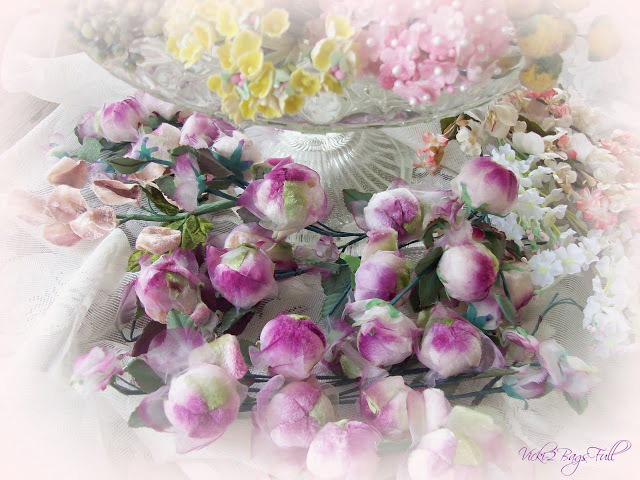 Hello my dear Suzy, These are such happy little buntings and just the perfect additions to Vicky's sweet spring nests. It's wonderful that you contribute to them. Your lace book preview is very promising and I have no doubts that the finished piece will be another gorgeous creation of yours. Lovely, the nests and the sweet little buntings.....and how wonderful that the proceeds are going to such a wonderful cause! Such lovely little buntings - perfect for a beautiful nest. And...I must say that I'm awfully glad you're addicted!! The tiny buntings are so beautiful. I'm always inspired when I visit your blog. I'm going to put it in my blog favorites! Sweet hugs! 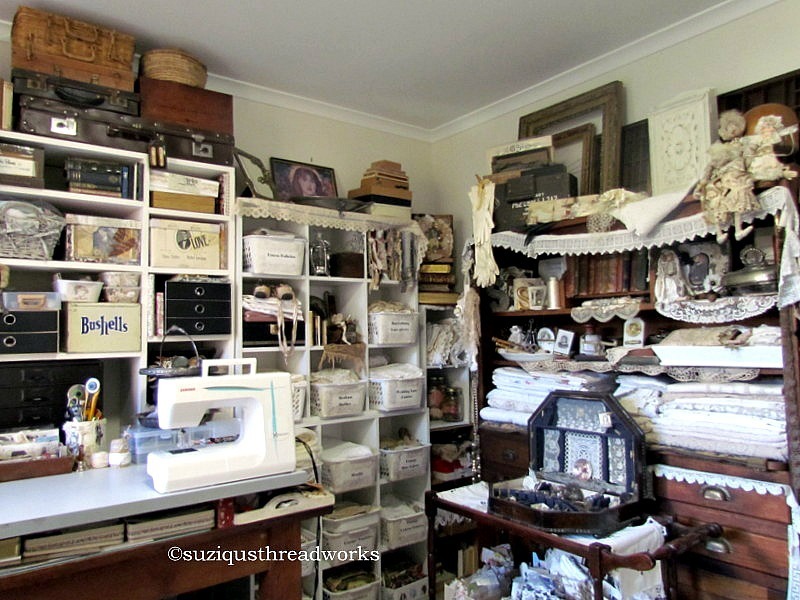 What a perfect combination, the buntings and nests. So sweet, and for such a worthy cause. 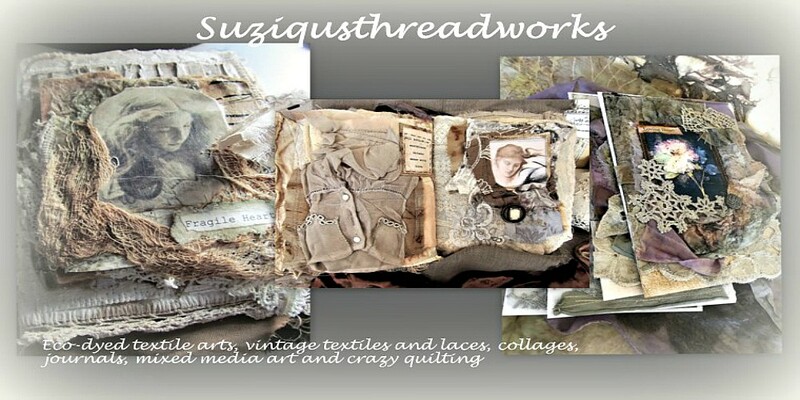 Suzy, I'm excited to preview your beautiful, delicate buntings for Vicki's nests! They remind me of the birthday banner that we hang to celebrate our grandchildren's big day(s). Your buntings are surely a symbol of hope for many happy birthdays for the little ones at Lily's Place. I'm looking forward to enjoying your creativity when I get my nest -- thank you! Your contributions are amazing and I can imagine how delighted you are to be included in the loving work of Vicki's hands. BEAUTIFUL - I love the generous and kind person Vicki is. Seem that beauty and kindness goes hand in hand with a lot of the blogging community. I can't wait to see these nests. I have one on order myself from Miss Vicki. That bunting is just the perfect touch Suzy! Thanks for the shout out Suzy! 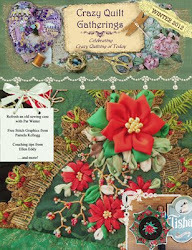 I am honored to share in the making of little add ons for Vicki's sweet nests. Love the buntings you have created. Somehow I lost you on my reader...following now on Bloglovin.